This section has been added to show our answers to questions about Trail location and track construction for Stage 3 of the Trail - Awa Whio Whio (Duck Creek) to Hikuai. As at 1st July 2017 the Trail Committee was waiting on a decision from Waikato Regional Council for resource consent. Physical work on Stage 3 has not yet commenced. Nearly all the questions have come from people within the Hikuai Community. Anyone with a question about Stage 3 may send it by email to pauanuitairuatrail@gmail.com. You must supply your name and address, but they will not be published if you ask us not to. We will usually put your question and an answer on this website unless the answer is already here. We would be grateful if you could carefully read the material in this section of our website before submitting a question. Most answers required will be in the material already published. Many other answers are in our application for resource consent which is available from Waikato Regional Council. The Trail Committee is run almost entirely by 8 unpaid volunteers who, between them, maintain the Trail and attend to all administrative matters including the very detailed, and at times, onerous requirements of WRC and DOC. Among other things we also run this website. All the volunteers have commitments to other groups including other charities. Some have business commitments as well. They do not have unlimited time to deal with Trail matters. We will not respond to any questions where the answer is already on this website or in the resource consent application. Note: This section is for questions only. The questions must be sensible. We will not necessarily respond to all questions. Q: Do you think the HDT will go ahead with surveys of the marginal strip? the reason I ask is that I can see from aerial imagery of our property the marginal strip appears to be located in the river itself (due to the river having changed course/erosion etc). A: HDT will definitely have to survey the marginal strip. We will probably start at the Duck Creek end whenever we do this. Yes, it is possible that the marginal strip may have been slightly eroded by the river in places but from satellite imagery (dated 2016) and boundary overlays done to date, we know the strip exists in sufficient widths along all the areas we intend to place the trail for stage 3. The exact locations will be confirmed during the topographical survey. The following document (with possible minor changes) was sent to some of the landowners adjoining the proposed riverside route in February 2017. Maps of the proposed Trail route were attached. A spokesman for the landowners has not responded to a recent request for us to publish the document with their questions. Thank you for bringing your collective concerns to our notice. As you know, our chairman Gary has been in touch with each of you on many occasions and he has done his best to keep you informed. We are aware of many of the issues you have raised. We hope these notes will allay some of your fears and that we can all work together, cooperating with each other wherever possible, to satisfactorily complete the extended Trail. Section 1 is intended to answer some of your questions and concerns. Section 2 answers more of your concerns and contains some of the information that will be included in our application for resource consent. This section includes information about the formation of the Trail. It describes how bridges and boardwalks will be designed and built. It deals with drainage and floodwaters. A plan showing two possible options for the route of the Trail extension from Duck creek to Hikuai is attached. Section 3 contains parts of the Walking Access Act 2008. They provide significant protection for adjoining landowners like you. We expect Walking Access will own the easements legally creating the Trail. The easements should be created soon after the Trail has been completed. The Act will come into force when the easements have been created. Note: the Walkway Access easement will include exemptions allowing bicycles, dogs on a lead and vehicles being used for maintenance purposes, on the Trail. We are still considering options regarding the final location of the Trail extension to Hikuai. So far negotiations have not reached a point where it is clear what option will be chosen. However, even if we choose the second option in the short term, our long term goal is to use the entire marginal strip, starting from Duck Creek. The public clearly prefers this option because, among other things, it is much more scenic and it keeps trail users safely away from the busy road. Our representatives and contractors should not come on to your property without your consent. We will do everything possible to make sure they comply. Note, however, that this does not apply to the “marginal strip” which is public land. The Trail maintenance crews will not be permitted to spray any vegetation on private land without the owner’s consent. We can say, without any hesitation, that people using the existing Trail leave virtually no rubbish on the Trail. We invite you to walk the existing Trail and see for yourselves. Any small amounts of rubbish left lying around will be picked up by the maintenance crews. Issues concerning drainage and flooding are dealt with in section 2. We do not intend, at this stage, to provide toilets on the trail. But this is something that could be considered in future. We doubt that trail users will approach adjoining landowners for use of their facilities. During planning and construction of the existing trail, we have consulted local Iwi, Ngati Maru and Ngati Hei. Ngati Maru have been particularly helpful and we have respected their wishes wherever possible. Consultation is in progress for the next stage to Hikuai. Maintenance. Our understanding is that TCDC will technically be liable to maintain the Trail once construction has been completed. TCDC will delegate this responsibility to the Trust which will carry out this work as it does on the existing trail. If for any reason it fails to do so TCDC will, presumably, appoint another group to do so. We will let you know when our application for resource consent is ready for filing. Members of the public using the present Trail are constantly asking when the next Stage will be started. There is very obviously a significant demand for the extension. The Trail committee is determined to push the Trail through to Hikuai. It would like to do so with all of us co-operating to the fullest extent possible. There may be some intrusion on your privacy. With co-operation the committee can keep it to a minimum. We are happy to consider any requirements you might have in relation to security and privacy issues as long as they are reasonable and cost effective. Existing vegetation, fencing, new screen planting and warning signs are all matters that can be discussed along with anything else you regard as relevant. We are happy to discuss the exact Trail location within the marginal strip. For example, the distance between the Trail and your boundaries. We will consider concreting the Trail where it is close to sensitive areas. We appreciate that you have some concerns about what a completed Trail might bring. However, please don’t overlook some of potential positives. In some cases, we expect significant improvement can be made to your river outlook without cost to you. The work we do in relation to the Trail, including what we do for privacy and security purposes, might well improve your property. It may be that the value of your property is actually increased. The successful predator control program we have been using on the existing Trail has accounted for at least 40 unwanted pests like rats and stoats. We have already noted an increase in bird life as result of this program. We will carry the program, with all its benefits, forward on to the extended Trail. We do not see any point in a representative of the Trail committee attending a public meeting because there is really nothing of consequence we can add to these notes. We will let you know as soon as possible if there are any future developments that significantly alter any of our current plans. Our greatest concern is that many of you are close friends with some members of our group. Gary, and the rest of us, are very anxious that these friendships are not affected by these proceedings. There may be times when agreement cannot be reached, or negotiations become difficult. Whatever the outcome, we hope these long standing relationships will weather any storms and remain as they are today. Waikato Regional Council already approved a Resource Consent for the removal of sand from the Tairua River, for use on the Trail. This sand is quite different from the fine sand that has caused minor problems on the northern end of the existing Trail during this summer’s dry spell. The Resource Consent application for the extension of the Trail is under preparation and will be submitted to WRC shortly. The trail will be constructed to follow the natural contours of the ground and any raised areas will be kept to a maximum of 1m height. Suitable culverts will be used for drains. Flood waters will be allowed to wash over the trail in low lying areas. Coarse river sand will be extracted, laid and compacted where necessary on the trail route to provide a relatively smooth walking/cycling surface. The public marginal strip is nominally 20m wide but the trail on the strip is only 2.5m wide. It is highly unlikely, in our opinion, that any trail construction material will be washed onto adjoining private land. Our experience on the existing trail has shown that even in major flood events, no material has washed off the trail and the trail quickly recovers to its pre flood condition. The coarse river sand will be even better. It compacts to a concrete like consistency and is very stable. All bridges and board walks will be designed by professional engineers. They will be constructed using high quality, fit for purpose, materials. Little or no vegetation that is not immediately in the path of the 2.5m wide trail will be removed. We intend to preserve and enhance the natural flora and fauna. The vegetation will provide a natural screen where it is required. Further planting will also be considered where desirable. (d)generally promoting and maintaining the walkway for the pleasure, safety, and welfare of members of the public. (i)erects a structure on or over a walkway. (2)The onus is on the defendant to prove that at the time of the alleged offence an activity is authorised. (b)knew that the offence occurred on or in relation to a walkway. (b)whether or not the plant or part of it is removed from, or subsequently returned alive or dead to, the land on which it grew. (c)damages, destroys, or alters a structure that is on, over, or adjacent to the walkway. (3)In prosecuting an offence against subsection (1) or (2), the prosecution must prove that the defendant knowingly, intentionally, or recklessly committed the offence. The following paper was presented by Andy Bolton to the meeting held at Pauanui on the 23rd July 2017. Andy responded to questions raised at a meeting in Hikuai in mid June. He was not able to be present at that meeting. My name is Andy Bolton and I am a volunteer working for the Hikuai District Trust. HDT’s vision is to create a first class scenic and safe walking and biking trail between Pauanui and Tairua. Today I want to talk to you about Stage 3 of the trail which will extend the trail from its current end point at Duck Creek to Prescott’s Garage at Hikuai. I am Project Manager for Stage 3. As a preface, I would like to state that the information provided today is all contained within our 220 page Resource Consent Application, which was submitted to WRC in May 2017 and which is currently being assessed by the Council. Our application is in the public domain and is available to anybody who wants a copy. We are currently dealing with a third request for further information concerning our application! As the proposed trail route for Stage 3 is probably the most sensitive issue that will be discussed today, I would like to address this issue first . Please refer to the map on the screen which has been prepared by our engineering consultants, Tiaki Engineering in Tauranga. This depicts HDT’s preferred route generally utilising the public land in the marginal strip along the Tairua River, together with a loop trail across Kahikatea Estate from the Hikuai Settlement Road to the river. 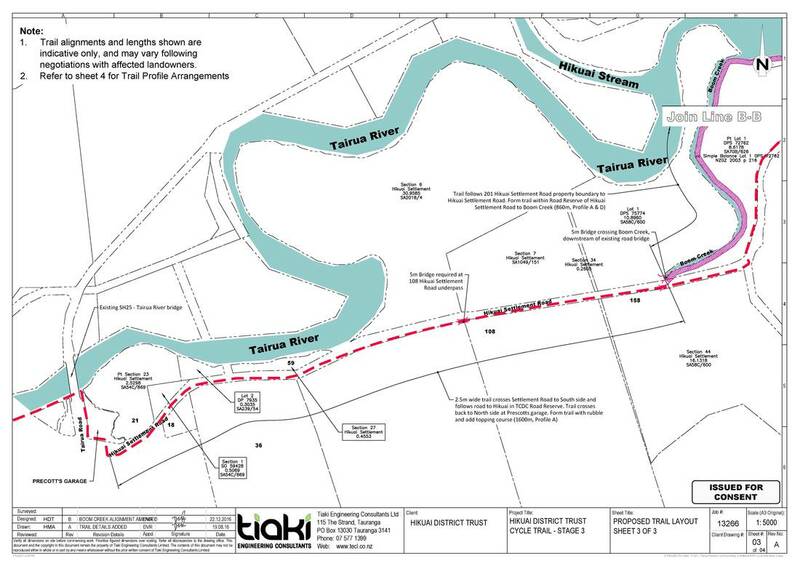 The vast majority of the users of the existing trail have expressed a desire for the trail to be continued along the scenic and tranquil side of the Tairua River, well away from the noise and dangers of the Hikuai Settlement Road (100Kph speed limit), where possible. HDT is committed to delivering this expectation but, at the same time, will be open to exploring different routing options where practical and economically feasible to do so. For example at the end of the marginal strip, we could simply create a turn-around point, explore bridging across to the Cabbage Patch area on the North Side or divert back to the road a little further back alongside 251,Hikuai Settlement Road. bank erosion, proximity to dwellings, natural and planted vegetation and ease of construction. HDT is aware of the adjacent landowner concerns for loss of privacy and security and these will be addressed with each landowner, as required, but typically there are number of steps which could be undertaken to ensure that loss of privacy is minimised and security aspects maximised. Optimal route selection will be utilised to keep the trail as far away from dwellings as possible, bearing in mind other constraints. Screen planting could be undertaken with native trees in accordance with landowner’s choice and adequate fencing could also be installed to ensure that trail users keep to the track. In addition, signage could be utilised to warn trail users that “The trail is close to a dwelling in this section and users should respect the privacy of adjacent landowners. Please keep to the trail at all times”. The cost of these solutions will be met for by HDT and NOT the landowners. It is worthwhile mentioning that Stage 3 of the trail will very likely be utilised a lot less than the first 4km of the trail from Pauanui, which will continue to be popular during holiday periods, as the start of this section is some 4km from Pauanui or 6km from Hikuai. It will only be utilised by the more serious walkers and cyclists who will be unlikely to stop en route. HDT is also considering the installation of a long drop or composting toilet (DoC Style) at around the 4.5km point from Pauanui. The 2.5m wide trail will be a low profile construction following the natural contours of the land specifically in the river flood plain. The trail will need to be “benched” and retaining walls constructed where necessary in the road reserve areas where the terrain is steep (up to 5m vertical height difference in many places). Construction of the trail will be relatively simple and therefore at lower cost in the flood plain but not so in some of the road reserve areas. Construction methodology is fully detailed in the Resource Consent application and will vary according to the type of terrain to be crossed. In essence the plan will be to clear away unwanted bush and trees, noting that only vegetation directly in the path of the trail will be cleared. The top soil will only be scraped away where necessary and stock piled. Levelling of the trail route will be undertaken by a scraper blade or bucket. Coarse gravelly sand, reclaimed from sand banks in the Tairua River, or imported metal/aggregate will then be laid and compacted on the trail route as required. The stockpiled soil will be placed on the sides of the trail as part of the landscaping/contouring. In places where the ground is very boggy or prone to flooding in high tidal conditions (but not in extreme flood events) 2m wide boardwalks will be utilised. Fencing, signage, planting, etc will then be installed as required. Any dangerous overhanging branches will also be removed. Small drains will be crossed using culverts as per WRC Best Practices guidelines and larger steams and drains will be crossed using timber pole bridges. Additional and improved drains and flood control measures will be undertaken, such as the installation of non return valves in the existing riverside berms, where these have been either removed or have become ineffective (ie on the boundary of 455 and 403 HSR near to the river). Larger creek and river crossings will be effected by properly engineered, specifically designed bridges which will require the approval of TCDC, WRC and DOC as required. These will be largely based on steel frame work truss sections, already purchased, and will be specifically modified for each location. The trail will be constructed in sections and the trail construction corridor will be minimised so that machinery will utilise the trail, as it is formed, for access and egress. This will reduce the impact of machinery on the surrounding bush and land. HDT is intending to use a wide tracked skid loader for the trail construction. This piece of equipment typically has a track footprint of 1.4m long by 0.3m wide for each track and weighs about 3 tonnes. In some areas a small digger may also be used. Trucking will only be used during the reclamation and stockpiling of river sand. The truck will only operate on pre-formed tracks. Any stockpiles will be adequately protected in accordance with WRC guidelines to prevent any run off in extreme weather event conditions. Some of you have raised concerns about the stability and longevity of the trail surface in the flood plain. Firstly, we need to understand the frequency of these severe weather events which lead to flooding. HDT has compiled statistics taken from local observations and the WRC rainfall data base over the last 10 years .Based on road closures of the HSR , which is fair assessment of a major flooding events, there has been an average of one per year , all be it we have had 3 this year! The trail will be properly constructed with a well compacted surface, following closely the natural contours of the land so any flood waters will wash over the trail as it will cause no impediment to the flood water flow, especially as most of it will be aligned with the flood flow direction not perpendicular to it. We know from our experiences on the existing trail that there are minimal chances of any trail construction material being carried over onto adjacent land. This was well evidenced in the recent flood event in March 2017 and is also supported by the stability of farm driveways constructed of the same river sand material but of much higher profile where there has been negligible carry over of material to adjacent paddocks in these flood events. In fact all of the debris that is carried over to the paddocks is generally river bourne debris washed down at these times. HDT is committed to inspecting and maintaining the trail to ensure that it remains serviceable. Our maintenance records show that after the flood event on March 7/8 2017, our crews were out removing river bourne debris and other inorganic materials like plastic drums and bottles. It is safe to say we are doing our bit for the community to keep the Tairua River flood plain in pristine condition! The greater Hikuai community has complained that it has not been consulted or kept informed. There is some justification for this view but frankly there is no limit to the extent of the consultation process! About 5 years ago Hikuai residents were given the opportunity to phone any 1 of 5 given phone numbers for information about the Trail. HDT has not received any calls, to the best of its knowledge. HDT is also not aware of any requests for information or consultation for Stage 3 being made by anyone from the greater Hikuai area until the recent meeting there on 22nd June. (Landowners along the Stage 3 route excepted). Our focus has always been on discussing matters with landowners immediately adjacent to the proposed route along the river. In February this year they submitted a lengthy list of questions to us. We responded immediately with 7 pages of explanation, including the same route maps as you have seen today. We undertook to let them know when our application for resource consent was filed, which we did. Some of them have a copy of the application – well over 200 pages. Those landowners have been fully informed. HDT don’t know if or when they have passed the information on to other Hikuai residents. The Trail committee took on board what was said at Hikuai on 22/6/17 and immediately after that meeting, took preliminary steps to get input from the Hikuai community. Late on Sunday afternoon 23/7/17 HDT received a letter from Hikuai residents with a number of questions, the answers to some of these questions will have been or will be provided today but it has not been possible to answer all of these questions in the short time available .We will discuss how we intend to provide further information at the end of the meeting. However please note that some questions will not necessarily be answered. The existing trail has been developed with the extremely generous financial support of the public at large and also some grants have been secured from such bodies as “Pub Charity”. We have heard is that the trail is “waste of rate payer’s money”. NZWAC have estimated that to construct the existing trail (4.2km), using conventional contracting methodology, would have cost in excess of $1M . By using ‘smart thinking’, volunteer labour, and reduced rate contractors and suppliers (and thanks to them, too, for their generosity), HDT has managed to complete this section of the trail for less than 30% of this estimated cost. Only 10% of this cost has come from the rate payers! For Stage 3 we have developed a business plan which includes estimated costing. Costing for 6-8km of Stage 3 is in the order of $500K based on the routing shown, which largely follows flat land and the marginal strip. In the event that we have to utilise the road reserve in places, then the cost will escalate considerably due to the steepness of the terrain, the requirement for large retaining walls, safety barriers and the need for further boardwalks etc. HDT has a detailed Business Plan which was presented to the TCDC Community Board. HDT has consulted with a large range of people, public bodies and Iwi. We have had several meetings with Ngati Maru, who have been very supportive and we have also kept Ngati Hei abreast of progress for this stage of the trail. We have ongoing discussions with both LINZ and DoC, in particular with the determination of the administering body for parts of the public owned marginal strip. Ultimately we will be required either to obtain an easement from LINZ or obtain a concession from DoC for the use of this land. We have had a detailed ecological study carried out for Stage 3 by Brian Coffey and he is here today to answer any questions, any of you may have, about the impact of the proposed trail on the ecology of the area. We are in the process of conducting a detailed archaeological assessment of the trail route to meet Heritage NZ requirements. We have in place a very robust predator control programme which has already “chalked up” a significant number of rat and stoat kills. This programme will be extended to Stage 3 and hopefully adjacent properties to the trail will see a reduction in unwanted pests too. We have certainly seen an increase in bird life on the existing trail since the introduction of the predator control programme. HDT is closely supported by the NZ Walking Access Commission, which was specifically set up to enable walk and cycleways to be developed across both public and private land and retained in perpetuity for public use. Felicity Brough from WAC is here with us today to answer any questions you may have in this regard. HDT is committed to providing a first class community asset, which can be enjoyed for generations to come, and in doing so has committed its resources to enhancing the beauty of the magnificent Tairua River Estuary and surrounds. Maps of the proposed trail route and flood statistics were also presented to the meeting. This section includes the letter sent by the Hikuai Community to HDT on the 23rd July 2017 and the Trust's answers to those questions. Q. The Resource Consent application to WRC shows the track going through private land where landowners have not given consent ie Duck Point and 201 Settlement Road. These are the two ends of the track before it meets the road. If you cannot get landowner permission what is the proposed alternative? A. The road side loop of the trail at Duck Point requires a small easement from the owner of Duck Point to allow the trail to pass safely next to the road. If the easement cannot be obtained then the roadside track will be deferred or a section of the road itself will be used. At 201 HSR, if an easement (approx 80m x 5m) cannot be obtained there are a number of options to be explored, which would include terminating the trail at the end of the public land in the marginal strip, building a bridge over the river or rerouting the trail from the marginal strip along the road reserve past 251 HSR etc. Q. If it is not possible to get to the riverside will a track beside the road achieve the vision of the Tairua/Pauanui Cycleway committee? A. We will always have access to the river as there is no private land to cross between 345 HSR and 251 HSR where the road reserve is immediately adjacent to the marginal strip. Q. Is there any precedent in New Zealand of a walking or cycling track proceeding through private land without landowner consent? A. Not that we are aware of, landowner permission is always required to enable an easement to be obtained. Q. Has the NZ Walking Access Commission (or anyone else) built a cycleway in the “Flow Zone” of a regularly flooding river? A. There are numerous examples of trails being built adjacent to rivers which can flood. We will research these to obtain further advice to construction methods etc. Q. If so please expand on where and the long term issues or maintenance required? A. An example is the trail that follows alongside the Hutt River in Wellington. Construction methodology and lessons learnt from this and other trails will be reviewed. Q. What can we learn from that? Q. Does the committee know that the proposed track position at 455 and 403 Hikuai Settlement Rd floods even at a King tide with no rainfall? Q. Do you also realise the track would be submerged up to 2m under flowing water during a normal flood? By the way we’ve had 7 already this year. A. The depth of water over the trail in flood conditions is not considered relevant as the trail will be unusable in some sections during flood events . HDT’s reliable information from both TCDC and WRC sources records only 3 major flooding events so far in 2017. Q. 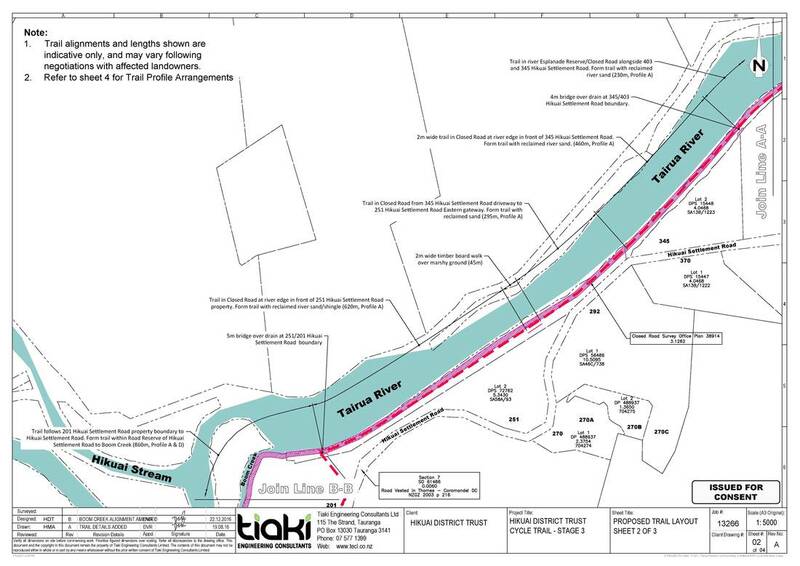 Do you have information regarding the flow rate of the Tairua river in a flood at Prescott’s Garage and/or other points within the stage 3 route proposal? Q. If not how is it proposed to identify where the track will come under the most flooding pressure? A. We are not concerned about flooding “pressure” as the trail will be constructed to a very low profile and in most paces will be roughly parallel to the flow direction. We know that raised up farm tracks which run perpendicular to the flow direction suffer relatively little damage during a flood event. These farm tracks are constructed of the same river sand that we are proposing to use on the trail route. Q. The Resource Consent application to WRC shows some construction profiles where the track will sit up to 1.0m above existing ground level. Do you have an engineer's' report on how this will affect flood water in Hikuai? What recourse will landowners have if it causes a problem? A. The trail profiles shown in the Resource Consent Application are indicative only and the trail construction will be kept as low as possible in the flood plain. We do not have an engineer’s report. HDT does not envisage any issues with its design for reasons stated above and the design will cause very little impediment to flood flow particularly as the trail route is, in most cases, parallel to the flow direction not perpendicular to it. HDT will provide clean up services if any of the trail construction material is washed onto adjacent land owners properties. Q. What arrangement is proposed to ensure the Cycleway committee will continue to monitor and repair this asset? A. HDT volunteers are committed to keeping the trail open for as many days per year as possible. It is well equipped and resourced to do this. HDT is obliged under its current approved Resource Consent to inspect and repair the trail after each flood event. HDT maintains records and photographic evidence which demonstrate that it is complying with its commitments. Q. No mention has been made of fencing in the Resource Consent Application to WRC. Q. What fencing is proposed to ensure safety of track users and security of neighbouring livestock? A. HDT will provide and maintain fencing as required but land/stock owners also have an obligation to fence their properties and prevent stock from entering the marginal strip and water courses. A. HDT will design and install appropriate safety barriers. Q. Who will foot the bill for initial fencing? Q. Who is proposed to be responsible for ongoing maintenance? A. HDT will maintain any fencing it has provided and installed. Q. How do you intend to manage debris in fences following high rainfall events? A. HDT will be responsible for removal of any major debris from fencing it has installed in the same way as landowners are responsible for maintaining their own fences. It is our understanding that surveyors have been engaged. Some residents asked surveyors to leave their property after having no courtesy call or notification of their visit or intention. Q. Who engaged the surveyors? Q. What was their brief? A. Three surveys have been carried out, to date, to determine the space available for the trail between the Road Reserve and adjacent property boundaries. Q. What have they found/reported? A. Survey results have been provided to the three landowners whose property boundaries were surveyed. In general it should be noted that property fences have encroached into the Road Reserve area in many cases. Accurate data has been recorded but the boundaries were not pegged. Q. Why was no notice given to landowners? A. Notice was provided to all landowners except one. HDT will advise landowners if further survey work is to be undertaken in the future. Q. Has any assessment been done of the impact of ‘unintended consequences’ of the track?For example; What capacity do local accommodation providers have for more bed demand? What impact will increasing visitor numbers have on the DOC facilities in the Puketui Valley? What impact will an increase of cyclists have on the safety of Puketui Valley Road? Where the track goes alongside Hikuai Settlement road, what impact will this have on future road widening/realignment? What will the impact of a safety incident on the track beside Hikuai Settlement road have? Will the Cycleway committee have any liability in the event of a safety incident? A. Most of the above questions are not within the remit of HDT and HDT would advise that these questions be referred to the appropriate authorities or organisations such as TCDC. HDT has a Health and Safety Plan, which details the response actions in the event of any incident. HDT also carries Public Liability insurance. Q. What will happen in the event of land subsidence? A. Like any subsidence event, if such an event was to affect the trail, the immediate actions would be close the trail, assess the damage , make the area safe and subsequent fix the problem as soon as possible. Q. Will the Cycleway committee need any public liability insurance? A. Yes, it already has this. Two meetings have been instigated by the Hikuai community after concern at a vacuum of information regarding the cycleway. The second meeting the Trust declined to attend. A. HDT advised the Hikuai Community that it was unable to attend the June 2017 meeting which was called at short notice whilst the Trust Chairman was unavailable and the Project Manager was overseas. Apologies were duly sent. 3 Trail committee members were, in fact present. Q. Do you believe that your statement on page 9 of the Resource Consent Application (reproduced above) is accurate? A. Presumably you are referring to the statement on page 45 of the Resource Consent Application not page 9. Yes, we do believe our statement is accurate. Consultation with affected parties has been undertaken and these parties were, for example, provided with Stage 3 route maps and other information in writing in February 2017. 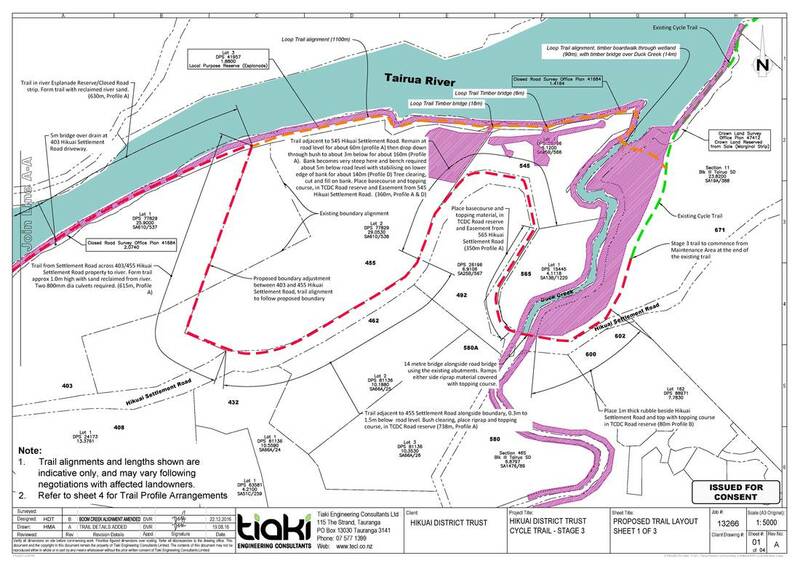 Wider consultation with TCDC, Iwi and DoC has also been undertaken. Regular press releases in local newspapers and newsletters have been provided. In addition HDT has provided regular updates on the Pauanui Trail website. Q. What plans are in place to ensure that the affected landowners feel respected and valued and supported rather than coerced and bullied? Q. Going forward how do you intend to keep open dialogue with the wider Hikuai Community? A. We understand now that a Hikuai Group has now been formed and HDT will endeavour to keep this group informed of any future developments which we can make public. Q. Has an ecological study of the wetlands been done? Does the committee know there is a family of Banded Rail (Gallirallus phillippensis assimilis) living there. If the track goes through the wetlands how can you assure that preservation and safe havens will be honored and left undisturbed? A. Yes, an ecological study was performed by Dr Brain T Coffey in December 2016 and this was included in our Resource Consent Application. Yes, HDT is fully aware of the Banded Rails and was instrumental in rescuing two orphaned chicks, which were reared off site then reintroduced to the area. These birds have been observed since their release. HDT is committed to ensuring that safe habitats exist for the Banded Rails and other species. It has consulted with it’s ecologist and taken advice as to the best method s to achieve this end.ie board walks which will be used in the wet land areas need to be of sufficient height to allow species to pass safely underneath. We appreciate that the list of questions is quite long but it is by no means all the questions that have been discussed amongst the community. To date the community feel that the Cycleway committee has made every effort to ‘divide and conquer’ rather than engage in healthy open discussion. As a community the cycleway will affect us all, not just those whose land it may pass through or adjacent to. We believe that every resident has the right to be valued and respected whatever their opinion may be. We are taking steps to engage legal counsel as a community to ensure that everyone understands their rights and obligations and no one is disadvantaged by their personal circumstances. We are sad we feel the need to do this as we do not oppose the cycle way but we do oppose it if it isn't done right by the people of Hikuai. As a community we have a long list of concerns regarding ongoing maintenance etc with the cycle way heading along the river but foremost we are are community that care about each other and we will not stand back and watch affected landowners take a massive personal loss. (privacy wise, security wise and most importantly financially wise, as there won’t be too many people wanting to buy a property with a cycle way running metres from their house). This is going to affect their land price which in some instances is their life's work. It is a huge personal sacrifice and these people have every right to be very upset about it when there is another option. To put a cycle way by the river may be legally correct in SOME places but this is a COMMUNITY project and therefore we feel it is about what is morally right by the people that live in the community. If the committee refuses to work with us and consider our preferred option, then the Hikuai Community will come together and say we do not support the cycle way and we need to fight for these people as they are our People and we do care. We look forward to an open and constructive meeting on the 25th July. This is Gary's response to a number of criticisms leveled against him, in his absence, at the June meeting in Hikuai. Thank you all for coming this afternoon . In 2012 Anne and I decided to cease the very successful Concert in the Orchard. During that last concert I made a public announcement to the 1500 people present that I was going to follow up on Ian Hopper’s dream of creating a trail following the river that would reach from Pauanui –Hikuai---Tairua. I made that commitment that day because I believed by stating that in front of such a large group of people it would force me to push on if things became difficult. Oh boy !!!! There certainly has been some challenges. There is a system in place that the trail team is required to follow. There is an old saying that is very relevant in this situation you should attack the problem not the person. I could resign or die but the problem of the land owners adjacent to the marginal strip would still be there. That is! there is a large piece of land that they feel they have a right to, but they do not own it. The dream was to create a safe cycling and walking trail between Pauanui and Tairua. Using where ever possible the unique and wide marginal strip that exists on most sides of the river. This land is public land. The greatest challenge I’m facing at the moment is that I have got off side with my neighbours. Neighbours are very important to me. I really do feel very uncomfortable with this state of affairs. But all the Trail committee, and all the members of the public we have spoken to, want the trail to use the marginal strip. I must admit it has always been my preferred route. I have already tried that. I have told the Trail committee that I would like to resign, twice. Both times it was totally rejected. But the Trail committee has partly gone along with what I asked. Andy Bolton has taken over as project manager and he is now in charge of all negotiations with property owners. I asked to resign because I did not want to get into arguments with my neighbours or damage friendships that I’ve had for many years. You can see my dilemma . My resigning would solve part of my problem but would not solve the concerned land owners or the trail committee’s challenges. My idea was to create an asset that would benefit and add value for all members of this wonderful community. It really saddens me that some members of the community we were striving to unify, have set out to try and destroy it with incorrect statements. Public opinion is strongly in favour of pushing ahead with this trail and the one good thing that came out of the Hikuai meeting was that the meeting voted strongly in favour of the trail. The challenge is where do we place it. Hopefully todays meeting will help to clarify the misunderstandings that have been fostered mischievously in this district. I genuinely hope that we can negotiate with Sam, the Dalgety’s and Warren Spain. This forum is not the place to do that. Name calling and a hostile public meeting is not the right way to move forward. We all live in a wonderful caring community. Please let us all build on that and work sensibly through these issues . They are all solvable with common sense face to face dialogue. Immediately following the Hikuai meeting some members of the trail committee met and agreed that we should try and improve our communication with Hikaui residents. We have been in touch with Sam Clarke, a Hikuai resident and have asked for help to try and figure out a way to have more open communication with the Hikuai community and get a better perspective of what the overall Hikuai community would like to see from the cycle way. Could I have a show of hands from people who are happy, in principle, with this approach. ​ It appeared that the meeting was unanimous in approving this approach. This is Anne's response to those at the Hikaui meeting who questioned our right to use the name "The Hikuai District Trust", suggesting it had nothing to do with Hikuai and had never done anything for Hikuai. Some people have questioned why our trust is named the Hikuai District Trust. With the realigning of the road and the new bridge the school was no longer visible. As well Morrisons store and butchery which had been the focal point of the district had closed and the name Hikuai was in danger of being forgotten. When a charitable trust was formed to help with the running of the concerts I chose to name it the Hikuai District Trust in an effort to keep our area known. The Trust also rust proofed the traction engine and helped lay the concrete base for it outside Prescott’s Garages. The trust also donated over $120,000 to the Auckland and Waikato Rescue helicopters. There are many people in this room who are well aware of the benefits the Trust has provided to the greater community.